After recent trends of lowering unemployment rates, which for Greece is currently 18.5% and in Spain 14.1%, these European nations have decided to raise the their minimum wages. Greece increased the minimum wage by 11%, while Spain bumped it up by a whopping 22%, the first climb in pay in several years for many citizens in both countries. The similar move taken by the respective governments comes despite the long track record of relatively high unemployment, which many critics say will only undermine and even reverse the progress that has been made thus far. However, many European economists support the increase, citing that “Higher salaries fuel greater spending, which can have a positive impact in the economy and lead to more jobs”. Still, many politicians and economists stay in opposition, both in European and the United States. Although the Greek and Spanish governments passed these reforms with good intentions in their hearts, the raising of the minimum wages will absolutely and inevitably increase not only unemployment, but higher prices for goods and services. 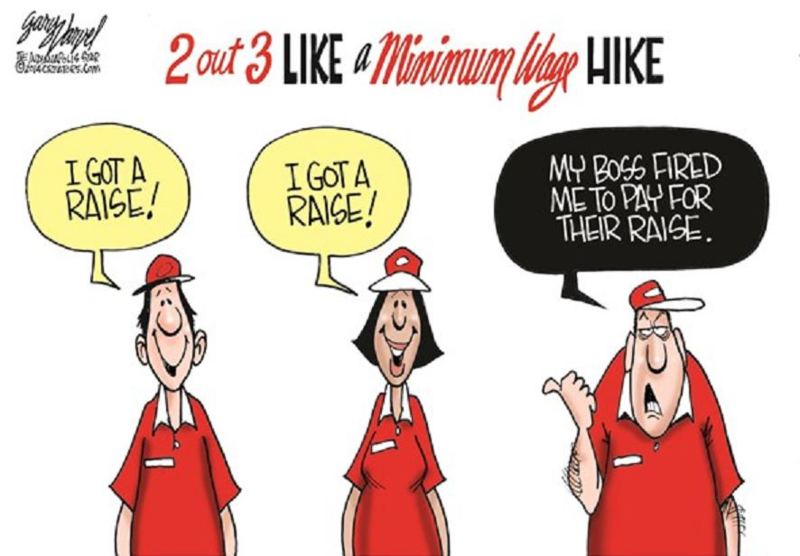 An increase in the minimum wage laws equates to a higher amount of money spent on payroll, which forces many small businesses to make a choice: either increase the cost of their products to offset the costs of paying for their employees, or lay off workers because they have become unaffordable. However, for most small businesses, these choices will end up being fruitless as their owners won’t be able to turn out a profit or be able to compete with larger businesses with more access to capital. In regards to larger scale businesses, if a human worker costs more than their labor is worth, most corporations could easily replace them with automation which don’t require a bi-weekly paycheck. Worse case scenarios, the enterprise simply closes their factories or offices and instead take their jobs to countries with lower minimum wages or none at all, which in fact is exactly what many large US companies do. The Socialist leaning governments of Greece and Spain, while wanting the best for their citizenry, have no understanding of the negative economic consequences these reforms will leave to, and might just become another cautionary tale of the dangers of government intrusion in the economy, something many Americans should stray away from.